Romeo and Juliet sitting pretty for the camera. 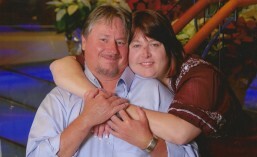 My husband and I have been married close to 13 years. At the beginning, we lived in a very modest apartment with hand-me-down furniture or throw-away pieces that my mother would find sitting by the dumpster. After a while, my husband was anxious for us to buy a house. Several times we made appointments to talk with a loan officer only to cancel because I really wasn’t comfortable making that move yet. Now all my life I have had a dog. I love them. Our entire time in the apartment, I would lament to Chuck how I wanted to get a puppy. Though he also loved animals, Chuck was completely against getting any animal because he knew that, with my travels, he would be its primary care taker. At the same time, Chuck was wanting a place to continue working on his dream car. My husband turned that longing into a “deal”. He offered to agree to get a dog of my choosing after we bought a house with a garage. After careful consideration, we shook hands to seal the deal as proper business people. It wasn’t long after the “deal” that I was approached by my company about a potential move to Florida. We made a couple of trips to check out the area and look for houses. We found the house of our dreams and took the leap. During the excitement of our big move, I completely forgot about the “deal”. Of course, my husband didn’t remind me either since it was really in his best interest to keep quiet. Romeo taking a nap, but ready to pounce on anyone getting close to him momma. It would be close to three years before I actually remembered our agreement. When I did remember, I began doing research on dog breeds to figure out the type of dog that would fit best in our household. 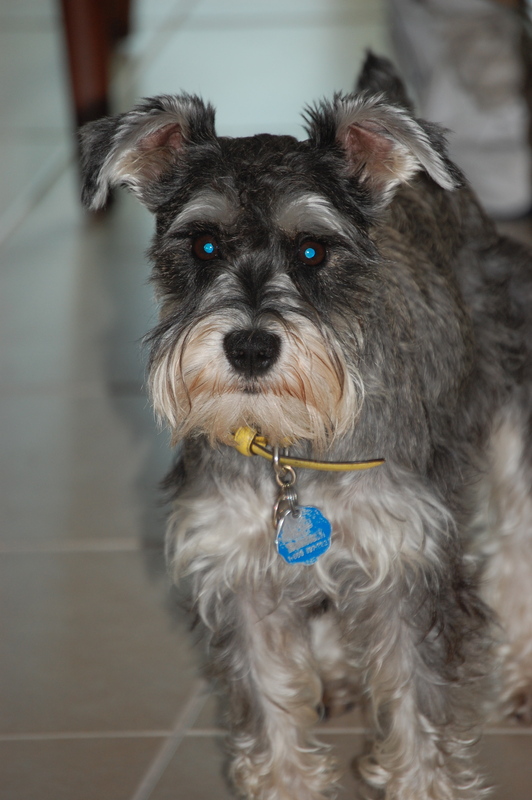 Once I had settled on a miniature schnauzer as the perfect breed and found an available puppy close by, I was ready to lovingly remind my husband of his side of our bargain. We were sitting at dinner one evening, when I asked Chuck if he remembered our deal. Of course he did, but I sat patiently waiting for him to fall into the trap I was setting for him. After he acknowledged that he indeed remembered our agreement, I was ready to spring the trap. I was giddy with excitement to see his face when he realized he had been set up. I politely reminded him that he had not kept up his end of our bargain. I also reminded him that when we purchased our house, we signed a loan agreement with the bank and agreed to pay a late charge if we did not make our payments as agreed. Of course he knew that, he signed the documents too. Anyway, I informed him that although our “deal” was not in writing, it was considered a contract and would likely hold up in court if it came to that. I reminded him that our agreement was that I would get a dog when we purchased a house with a garage. Our purchase was completed over 2 years prior to this conversation, but I had yet to receive the dog. I calmly informed him that he was now in default of our agreement and the default interest rate was kicking in. When he inquired what the default interest rate was, I explained that he was now required to purchase me a dog for every year he was late in fulfilling his end of the bargain. He was up to owing me two dogs and was very close to owing me a third dog. I was demanding payment in full or I was taking over the garage and selling his dream car. Now it was not my intention to take over the garage, I simply wanted what I was promised, a dog – but now I was going to make him pay for not keeping his word. Immediately purchase the miniature schnauzer puppy I had found. He was required to make the purchase within the next seven days. 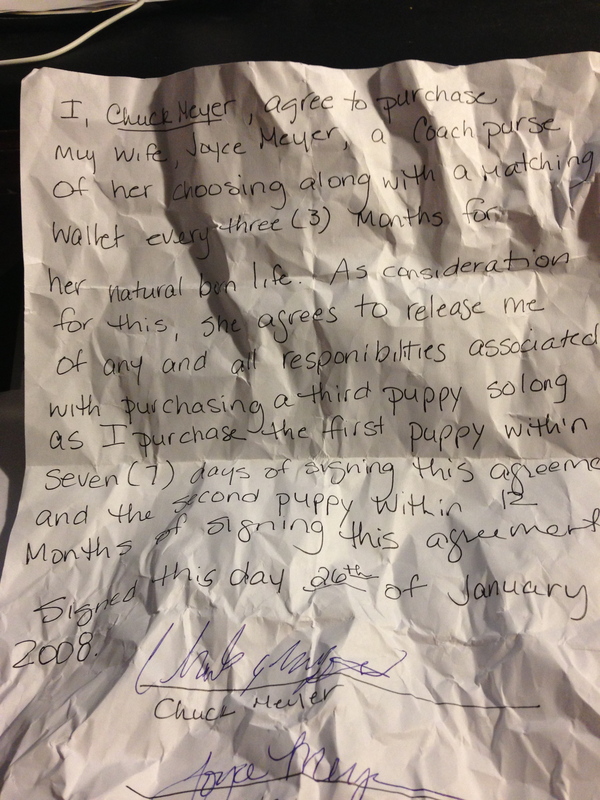 What he didn’t realize is that I had already contacted the breeder and had made a deposit on the puppy. We were scheduled to pick him up the following Saturday. Agree to allow me to find and purchase a second miniature schnauzer puppy within the next 12 months. I had always wanted a matching set. Agree (in writing) that he would purchase me a Coach purse of my choosing with a matching wallet every three months for the rest of my natural-born life. I figured the requirement over the purses was probably a stretch, but why not go for broke. I was bracing for the worst while he contemplated his dilemma. You could have knocked me over with a feather when he agreed to ALL of my terms. I immediately drafted a written document for both of us to sign and placed it in front of him. He questioned whether I trusted him. I did, but he had not followed through with our previous agreement and I wanted him to understand what the consequence would be should he choose to default again. He reluctantly signed the agreement and we sealed our compromise with a hand shake and a kiss. Later that night, I shared pictures of our new pup and the names I had come up with for this one (Romeo) and our future pup (Juliet). True to his word (and my planning), we drove to Jacksonville, Florida the following Saturday and picked up Romeo. On the way home, we stopped at the Coach store and picked up what would be the first in many, many Coach purses. Fast forward five years later to present day, my beloved has kept his word and fulfilled nearly all of the requirements of our agreement. 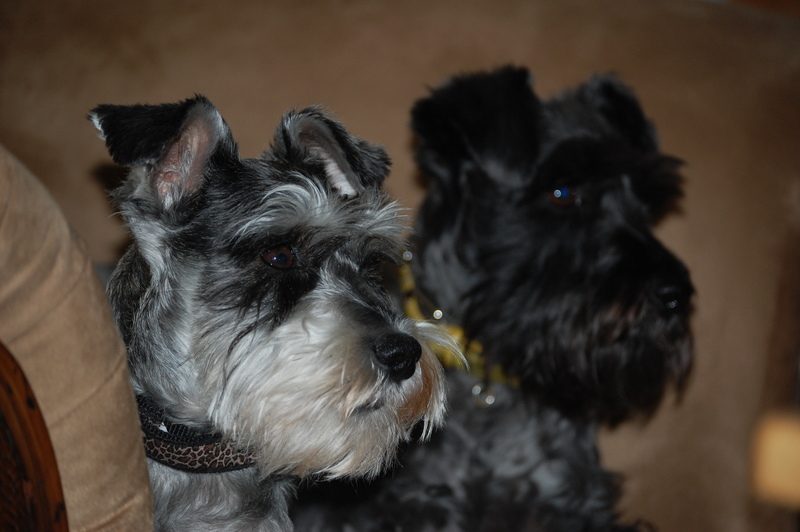 We have two miniature schnauzers (Romeo and Juliet). He has also somewhat refrained from complaining as my collection of Coach purses grows. Now I really don’t buy one every three months, but when he starts complaining, I make sure that I could be getting them four times a year instead of one or two. That usually quiets him down a bit. 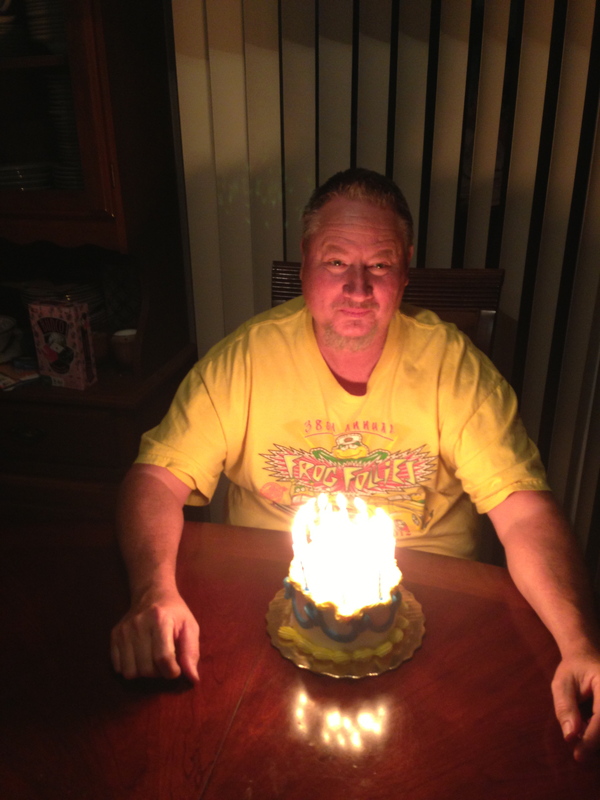 Today was his 50th birthday. We decided to go to the mall to pick up a few things. While we were there, he asked if I wanted to take a stroll to the Coach store. 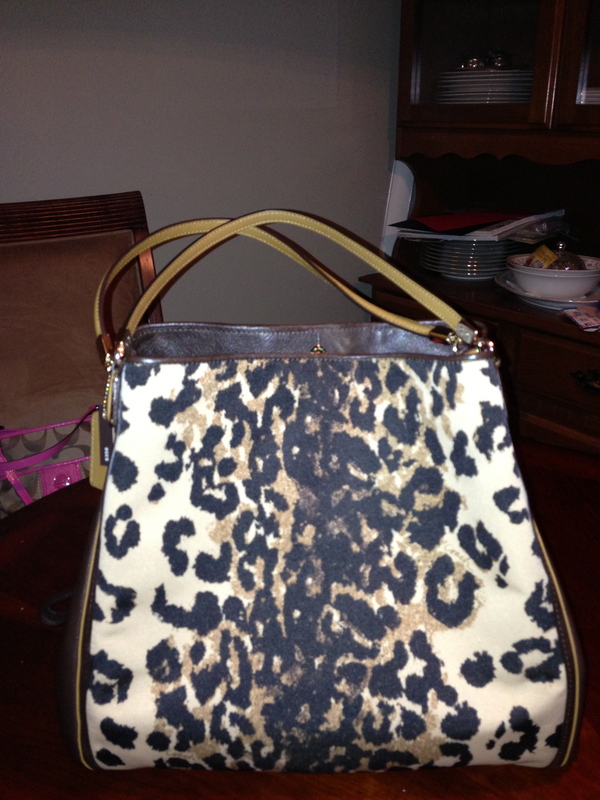 As we walked in the door, I spotted the most gorgeous purse I had ever seen. It was talking to me loud and clear. Chuck had walked by this purse every morning during his daily walks around the mall. He told me each time he’d stop and think how good that would look on my arm. OMG, he was so right. It was awesome. There was no way I was leaving without it!! He grabbed my arm and said “maybe later”. Are you kidding??? You bring me in the store, dangle the purse of my life in front of me, then make me leave. I don’t think so. What I realized was that he was playing my game. He had every intention of buying that purse for me. He just wanted to see me squirm kind of like what I do to him occasionally. The only difference was that I didn’t have to sign my life over to get it. Thank God, because I probably would have!! 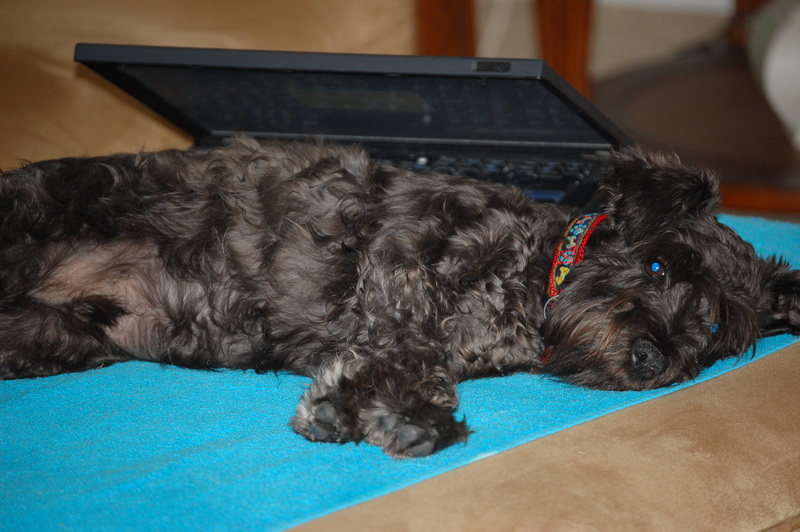 This entry was posted in Coach, Daily Prompt, Schnauzers and tagged Coach, Dog, Miniature Schnauzer, Puppy, Romeo and Juliet. Bookmark the permalink. LOL! Happy Birthday Chuck and I love the new purse.